The North Coast Co-op is once again hosting the Thrill of the Grill Barbecue Benefit for Food for People. 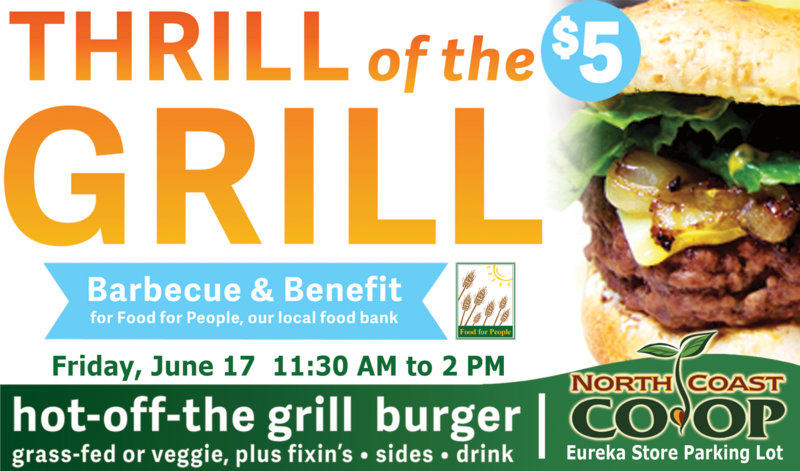 The Barbeque will be held on Friday, June 17th from 11:30 am to 2 pm at the Co-op’s Eureka location in its parking lot located on 4th and B Streets. The cost of lunch is only $5 and includes choice of Humboldt Grassfed Beef hamburger or Tofu Shop tofu burger plus organic green salad, chips and choice of drink. Jazzy sounds will be provided by local band, Dogbone. All proceeds from this event will support Food for People’s Child Nutrition Programs, which include Backpacks for Kids, Children’s Summer Lunch Program and the After School Snack Program, working to ensure that every child, every day, has enough to eat in Humboldt County. Each year the North Coast Co-op generously donates and prepares all food items with the help of donations from their vendors including Humboldt Grassfed Beef, Tofu Shop, Earl’s Organic Produce and more. Bring your appetite and your friends to this year’s Thrill of the Grill and enjoy great food, music and company while helping to protect one of the greatest resources, our children.